Guillaumin, (Jean-Baptiste-) Armand (b. Feb. 16, 1841, Paris, Fr.--d. June 26, 1927, Paris), French landscape painter and engraver who was a member of the Impressionist group. The longest surviving Impressionist, the most loyal, and probably the least known, Guillaumin was born in Paris of a family that had recently moved there from central France, where as a boy he spent much of his time. At the age of 15 he started working in his uncle's shop, whilst studying drawing in the evenings. In 1860 he obtained a job on the Paris-Orleans railway, continuing to paint in his spare time. In 1861 he entered the Académie Suisse and met Cézanne and Pissarro, with whom he was to remain on close terms for the rest of his life. 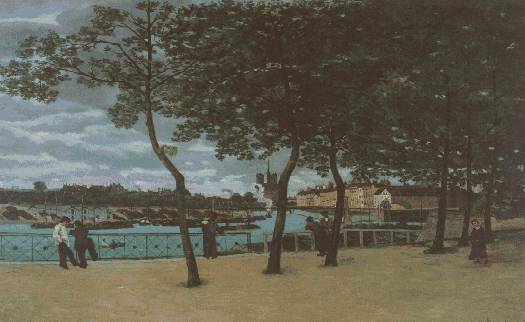 They spent some time together at Pontoise, and Cézanne was greatly impressed by a view of the Seine that Guillaumin painted in 1871 (Museum of Fine Arts, Boston). At this time all three were frequent visitors to Gachet's house at Auvers, and it was there that Cézanne did a portrait-etching Guillaumin. Cézanne also copied a painting by him of the Seine at Bercy (1876-78; Kunsthalle, Hamburg). Guillaumin exhibited at the Salon des Refusés and at most of the Impressionist exhibitions. Degas and Monet were not particularly impressed by his works, which were marked by a passion for colour that, towards the end of his life, brought him close to the Fauves. His prospects improved when he was taken up by the dealer Auguste Portier, who had commenced his career with Durand-Ruel, and he was assured of financial stability when he won a large prize in the Loterie Nationale in 1891. He became friendly with van Gogh, with whose work his own has certain affinities (1895; View of Agay , Musée d'Orsay), and in 1904 he spent some time in Holland. The vigour of his brushwork, and the obvious lyrical zest that informs his landscapes bring him close to van Gogh, and clearly influenced the young Matisse.